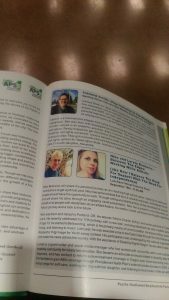 My experience at the September APSE conference was one of those experiences you don’t forget anytime soon. 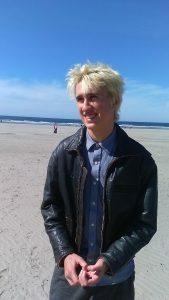 For one thing, it was in Seaside, and I absolutely love the Oregon coast. For another, I had the surreal understanding of watching my mom get really nervous before it was time to go up on stage. She was giving off this fluorescent yellow glow that would burst out in spurts at random times as she was trying to manage her anxiety. It was both hilarious and sweet to see how much she cared. My relationship with the coast is based on a few factors: there’s the smell of the ocean, the cooler temperature, the fresh air that makes me happy, and of course, the amazing seafood that we will undoubtedly eat. I think I would happily move to a small coastal town and live there forever. I wish I had the rural childhood my mom did because it sounds like she was outside all the time! Now for outdoor fun, we have to drive somewhere, which is just silly. Anyways, the conference was a lot of fun, even though it took weeks to prepare my speech. The way I write is to transcribe everything that I have prepared in my head onto paper. In other words, I mentally write a speech or a school assignment in its entirety that later I spell out so slowly and tediously with my para or my mom. Only when I can get it down on paper do I consider it complete and finalized. The idea of revisions is so ludicrous because I already worked all the kinks out in my head. Knowing that I have it all in my brain is both a comfort and a curse because of how long it takes to communicate it. At least I have a way to do that now. Giving a conference speech was an amazing experience, and not one that I take lightly. It is important to me that I share my thoughts and experiences in a way that is sincere and truthful, yet has a message of hope for our community. We are changing the way we talk when it comes to disability because when we express the unfair treatment we have gotten in education, employment, and housing, our issues have become more mainstream with every political candidate. I like to give presentations to people who have been working with those of us who have higher needs because there is a moment during every presentation when an audience changes from being a passive receiver of a story I am sharing to one that isinvested in the outcome. They might know someone like me, or are working with a family that is raising someone who is low-verbal, and have preconceived notions of their capabilities. 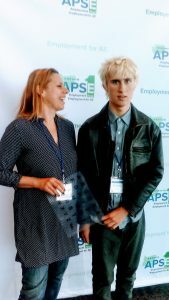 I love to see them have their “aha moment,” when their belief system gets blown away and hopefully is replaced with one that can believe in the capabilities and contributions of people with autism. It is a beautiful thing to witness. I hope that at the very least, they go home with a new perspective on what needs to change for the people they support or love so that they find a life that is truly theirs.